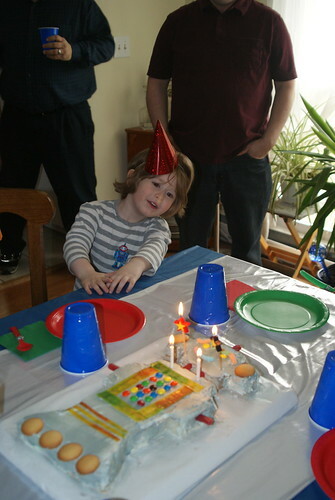 So, one of the crazy things that happened in the last year was Max’s 4th birthday party. I figured it was about time that I threw the kid a birthday party now that we were in an actual house that could hold more than 6 people at a time and he would remember it. Max was, and is still, obsessed with Robots. I would like to blame The Backyardigans along with Star Wars and the Daleks for this craze of his. 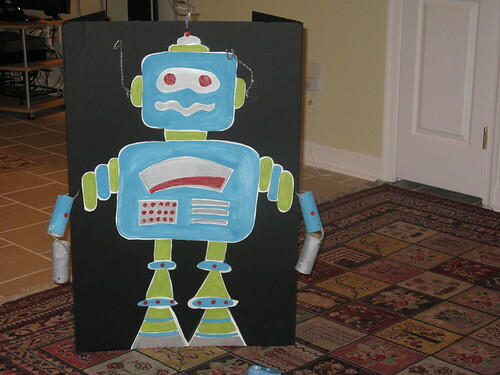 So how does one plan and create a robot birthday party? You troll the internet for ideas that you can steal ,ahem, borrow and use for your own devious plans. The list started out huge, of course. I had this fantasy that I was going to hang fabric – something sparkly and shiny and cover the table and floors in textured shiny vinyl…but Reality left a voicemail and said NOOOOOO! 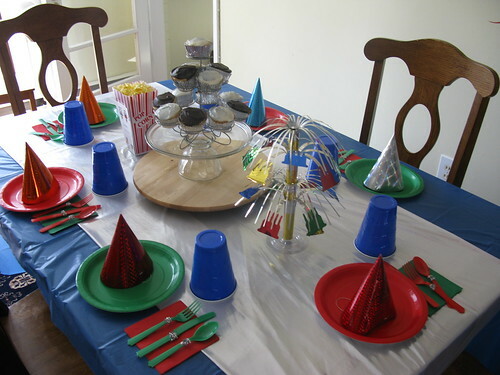 Thanks to 2 fabulous webpages Wendolonia and The Hostess Blog, I was able to create an invitation for the party and decorations. There were lots of snacks and a robot birthday cake. Betty Crocker has a “pattern” and video on how to cut and decorate your sheet cake into a tasty robot cake. It was a bit rough. I am sooooo much better with fabric than I am with cake. But Max loved it and that is all that matters. Macduff uses it in IV.3, but it doesn't give insight into the origin. (http://shakespeare.mit.edu/macbeth/macbeth.4.3.html) Must be older than Shakespeare? new webpage to stalk! thank you Alice! A Star Wars and Doctor Who nerd at age four -- a kid after my own heart! This looks cool, Marietta! And you're absolutely right -- if Max loved it, that's all that matters.